Plumbing is so functional! Its parts aren't designed to be beautiful but to be functional. Why is it when we use those same parts for another function they become some much fun? Check out these lights by Maxine Chanet. 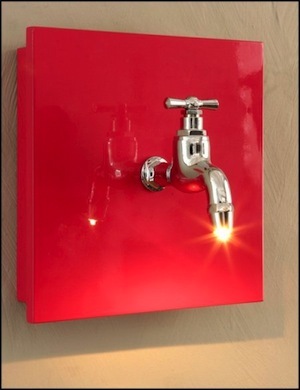 I love the concept- a faucet on the wall. When you turn it on, out pours light. I'd like to see the design hard wired in so that the base box wan't required. That would complete the switch. Pun intended :-)!